Identical twins need not be opposites -- is the decision one arrives at after a close, hard look at the characterisation of two protagonists played by Surya in the Tamil Diwali release, Vel. They can be each other's apposite as well, exhibiting brain and brawn alike. Of course, attempts to find the spear -- which is what the title means -- will lead to disappointment. That is because it doesn't show up after the titles have done their run announcing the cast with computer graphics and all at the start. There are no ambiguities in the tale, though. The protagonist played Surya is called Vel who wields his fists and swords with good effect. The audience is told that the look-alikes have been separated a few months after birth. Therefore, the fare is somewhat predictable. The first of the two grows up in a village as a ruffian under the gaze of foster parents while the other ends up heading a detective agency, situated in a swank office. Yet, the shamus drives only a two-wheeler, follows a maiden whose looks that suggest she ought to feel thankful for being chosen by a groom instead of investigating the suitor. The detective ends up admiring her female pal and bespectacled television reporter (Asin) rolled into one. The media personality's life's ambition is to join the BBC and interview the British Queen (obviously, the scriptwriters haven't heard that the broadcaster and British royalty don't get along too well!) after graduating from her small town idiot box job. One can take the fact that a smart and famous anchor wouldn't have guessed that her suitor (whom she is getting investigated) is the same private eye who writes a report shaming himself as a selfless gesture of love with a pinch of salt. Everything turns hunky-dory when everybody discovers the faux pas by the bride-to-be. The tag even dreams that he is gallivanting with the dame in an obviously foreign locale. Soon, the inevitable rendezvous of the long-lost siblings takes place. Before long, both of them are in the same village rooting for the same foster family. One thing leads to another and the switch too happens -- creating sentimental tearjerker interludes (good essay by Sharanya) and potentially dangerous situations thanks to a scheming but bumbling villain (Kalabhavan Mani) with a disposition as dark as that of the Satan. Mind and muscles work in tandem with some help from the camera wielding journalist and a distant rustic relative (Vadivelu, wasted). The latter always gets beaten up, no matter how minor the skirmish in the name of comic relief. In the end, after tense moments (including the poisoning of the matriarch of a village family -- excellent work by Lakshmi -- and a threat of multiple mayhems), the baddie explodes into flames and the two elderly women having a claim over each double agree to accommodate each other in a minor anticlimax. Director Hari has packed enough punches and swishes of swords to keep the proceedings' flow taut and nice. 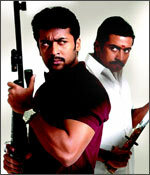 Though he has to walk along a thin line that identifies the two characters he plays, Surya has justice to his double-role. While Asin is adequate, Kalabhavan Mani grunts, groans and hams his way. Yuvan Shankar Raja's tunes are catchy -- especially the dream song "Kobakkara Kiliye." Though the producer M Chintamani hasn't plonked too much money on sets, it is obvious that oodles of cash have been splurged on converting automobiles into scrap by explosions (including a bus). Cinematography by Priyan, without being extravagant, has a few surprises -- especially during the shots of the hurtling train (probably the last time one would see a metre-gauge-train in a new movie) almost running over the cast. The saving graces of Vel include the fact that it is slick, neat, moves at a brisk pace to keep everyone interested, displays no cleavage and has very little blood and gore in spite of the violent storyline.